Heat the oil and saute the onion with the red pepper until soft and caramelised. Add the garlic and stir-fry for 1 min. Add the tomato purée and the white wine and cook for a further 10 minutes to reduce and cook off the alcohol. Marinate the meat in the cooled marinade for at least two hours or, preferably, overnight. Remove the steak from the marinade and fry it in the olive oil, in a hot frying pan, until done to your preference. Remove the meat from the pan, keeping it warm. Add the marinade to the pan along with the sugar and cook until the sauce starts to thicken. 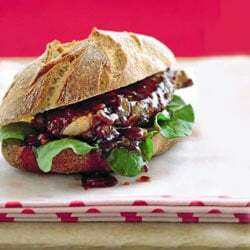 Place a piece of steak and some rocket leaves in each bread roll, and top with a spoonful of sauce. Chef tip: Use flattened chicken breasts for a chicken version.